At Cape Three Points on the beautiful Ghanaian coast, a canoe washes up at an oil rig site. In the canoe are the bodies of a prominent, wealthy, middle-aged couple, Charles and Fiona Smith-Aidoo, who have been ritualistically murdered. The Smith-Aidoos, pillars in their community, are mourned by everyone, but especially by their niece Sapphire, a successful pediatric surgeon. She is not happy that months have passed since the murder and the local police have made no headway in figuring out who committed the gruesome crime. 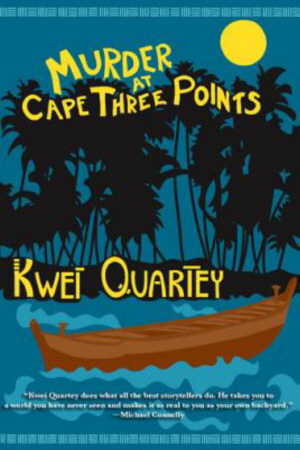 When the powerful Criminal Investigations Department finally agrees to get involved, Detective Inspector Darko Dawson of the Accra police force is sent out to Cape Three Points to investigate. The more he learns about the case, the more convoluted and dangerous it becomes. Three Points has long been occupied by traditional fishing populations, but real estate entrepreneurs and wealthy oil companies have been trying to bribe the indigenous inhabitants to move out. Dawson unearths a host of motives for murder, ranging from personal vendettas to corporate conspiracies.